100% silk. Traditional design with a batty twist. Look no further! 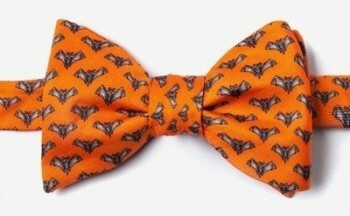 The Going Batty freestyle bow tie with a pattern of bats showing their wingspan decorate this bow tie and will definitely showcase your batty spirit. The matte finish and silk construction make this one durable bow tie.